We have done some work previously in the large Victorian properties in Gloucester Place in the centre of London. The buildings are typical of what you would expect to find in this prosperous area of London with large central staircases that spiral up several storeys to the top of the building. Now these staircases are just crying out for a large chandeliers elegantly swooping down. In this case the architect has designed a 3 lantern chandelier and asked us to make it for him. The lanterns were sourced from Italy and needed to be suspended at different heights from a black steel ring which was hung from the roof lantern. 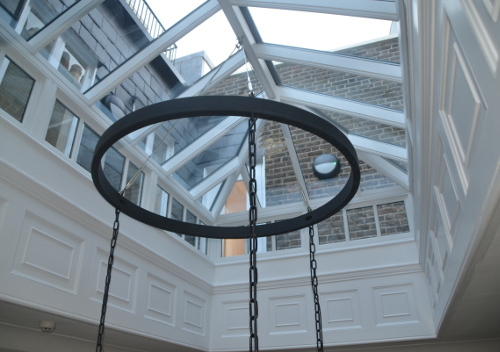 Here is is a photo of the completed top ring elegantly suspended from the roof lantern. The ring then had three black chains of lengths 12m, 8m and 4 meters and on the bottom of each chain a lantern was suspended. So that was the final product but now I will take you through a few of the issues in getting from the design to the finished article. The first challenging element was the black ring. This was 1.5m diameter and needed to be strong enough to support the long heavy chains and lanterns. To achieve the requirement this was made using square box section which was rolled into a circular profile. It was made in two parts and then welded together and finished so well that you could not even see the join. The other benefit of using the box section was that this meant that the wiring could be discretely hidden away. The three black electrical flexes that run up each chain are intertwined through he links then connected together inside the ring and a single clear flex was then led up one of the stainless steel support wires to the apex. Another interesting challenge was to make the ring hang level. The chain was heavy duty powder coated black steel and this meant that it had a considerable mass. As a result then the suspension point for the 12 metre chain had a far higher downward force applied to it than the 4 metre chain suspension point and consequently the natural suspension angle was going to be askew! In order to combat this then a longer wire was used above the higher lantern and stainless steel turnbuckle rigging screws were used for adjustment. This meant that a spirit level could be rested on the top of the ring and the turnbuckles adjusted until the bubble was centred and the ring was level. 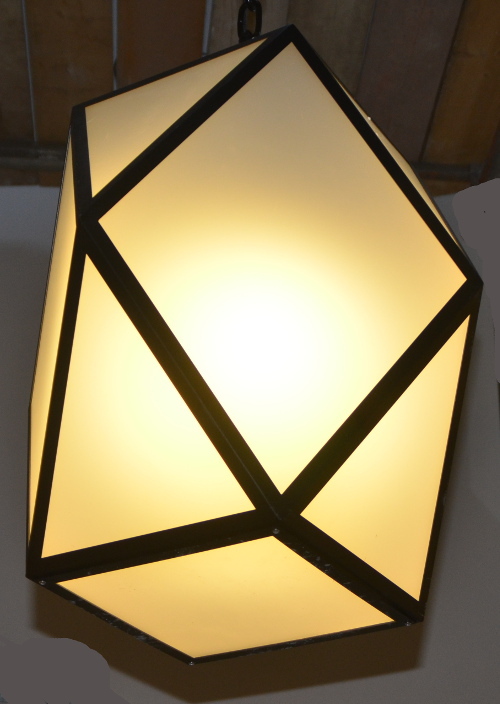 We often find that these nautical fittings are invaluable for certain aspects in bespoke lighting manufacture. As with many of these chandeliers which run through stairways it is always necessary to install the light with the scaffolding in place then carefully route all the chains in and out through the scaffolding, At the end of the process then the scaffolding needs to be carefully removed around the chandelier and it is only then that the light can be seen in its true glory and you can tell if the design aspiration has been a success.